Planning a camping holiday on the Zeeland coast? 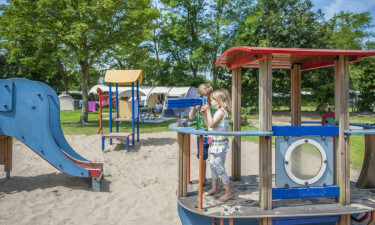 Lux-Camp’s Roompot Beach Resort set inside the Oosterschelde National Park is an ideal choice if you have your mind set on a relaxing, fun-filled, safe and comfortable luxury camping experience. Chalet and mobile home accommodation replete with a host of amenities, sport and spa facilities, Wi-Fi, and kid-friendly features at this holiday camping site are bound to make your stay truly enjoyable. Why Should I Camp at Roompot Beach Resort? The scenic setting of Oosterschelde National Park and the Zeeland shores a few metres away offer a soothing experience. Dedicated activity and gaming clubs for children of different age groups ensure that your kids thoroughly enjoy their camping holiday. Water sporting and surf boarding facilities are a boon for those who love spending time in the water. Excursions to the Delta Park, Delta Works, the Oyster Farm at Yerseke, and quaint nearby towns offer an interesting break from lazing at the beach. The sub-tropical pool complex at this luxury camping site comprises an indoor pool, an outdoor pool plus a wave pool to cater to different choices and weather! A separate splash pool for children with slides and other water features adds to the appeal of the space. Swimming, surfing and lazing at the beach is a given! Sun loungers and parasols are available and so are beauty and wellness facilities, including a solarium, Turkish bath and sauna. You can grab a bite or a drink at the restaurant, pizzeria or the bars at this holiday camping site. A supermarket and boutique are also located on the site to cater to your everyday needs.